These are pretty cool skates for a kid to start skating in. I bought them new and was very happy with them. They are like new really. GTX 500 Series Pacer Roller Skates Youth Size 4 color- Pink/white. Condition is Used. Shipped with USPS Priority Mail. Pacer Pro Series Speed Skates. The skates are in good condition with only minor wear. See all pictures for condition. And may have small flaws or minor wear. You Support A Dream. Vintage Pacer Crown Black Leather Boot Roller Skates Men's Size 8, Retro, Hipster Very good vintage condition with normal wear present. Vintage Women’s Pacer Roller Skates Never worn Excellent condition Women’s size 7 Comes from a smoke free environment. Fast shipping with insurance and tracking. Nothing fancy but it got it done. The Pacer Boot has wear around the the edge of one boot, and scuffing at the toes, Normal wear. Look at photo's. Loose ball axles but 7mm bearings will fit them fine. Vintage Pacer No. 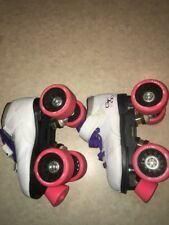 985 White Roller Skates Women's Girl's SZ 5 Pacesetter Wheels. Excellent pre-owned condition, please review pictures and ask any questions before bidding, thanks! These skates are a size 6 and lace up the front. The skate boots,laces,rails and trucks are clean (see all pics). Roller skate details •ABEC 5 (carbon steel). •Sport lacing hooks. I have described item to best of my ability. Sole is coming apart in the middle if the right shoe but does not affect use (see pics). No stoppers. No stains/tears/holes. Very good condition. See the Picture for details. All pictures are of the actual item unless otherwise noted. They show signs of wear and usage. There is writing on the bottom of the skates and on the inside of the tongues. The laces have stains. They are a size 5. I AM NOT THE ORIGINAL OWNER. Blue suede vintage pacer size 6 great shape other than than the tongue has some adhesive-that needs to be scraped off. They are a boy's size 4. They were only used for two seasons and only used indoors on the roller rink floor. They are in very good condition and there is nothing at all wrong with them. These skates are 100% ready to use and are still "in style". S ize 4 White b ooties with pink pom poms. Gently used. C hild only wore twice to skating rink. Condition is Used. Pacer GTX-500- Youth 6 Roller Skates-Black Sure-grip Model P217B pre owned. Good condition. Shows some signs of wear on the stops and scuffed toe on left skate. Black leather. Mach 5 wheels. A good pair of preowned Pacer QuadCruiser SP204 indoor speed roller skates in size 5. they have scuff marks on the toe protector on left shoe as shown. SP 204 SP204 PACER QUADCRUISER SZ. 6 SPEED QUAD ROLLER SKATES ROLLER SKATES GOOD CONDITION! Vintage Pacer Roller Skates. Condition is Used. Pacer ATA 600 Roller Skates Size 4. Wheels: Pacer ETX 63 mm x 42 mm. Quad Skate Boot. Formula Speed. boys Size 2. Boot's Only. Girl's Pacer Lite Rockers Indoor Roller Skates, Sizes: US 3, UK 3, EU 34, JPN 23. Condition is Used. Shipped with USPS Parcel Select Ground. Pacer Skate Boots. The Pacer Roller Skate Boot is designed for all Levels of rollerdance, roller freestyle and Occasional rollerskater. Artistic Roller Skate Boots. We are not a Distributor.